The descendants of a north-east preacher have visited his family’s restored resting place. Deer Community Council’s funding bid to clean up the gravestone of James Robertson’s two wives was rejected by Aberdeenshire Council last year. But relatives then provided the money and Mr Robertson’s great-great-granddaughter Katherine Downney travelled from Ontario, Canada to see the monument at Old Deer Church for herself. She was joined by three generations of her family. Historian Aly Black, who champions the restoration of Old Deer church, helped arrange the visit. He also told the transatlantic visitors about their James Robertson’s links with the area. Mr Black said: “Katherine and her sister, along with their daughters and grandchildren, visited the Old Manse in Stuartfield. “The nine Canadians heard the history of the church and old manse. 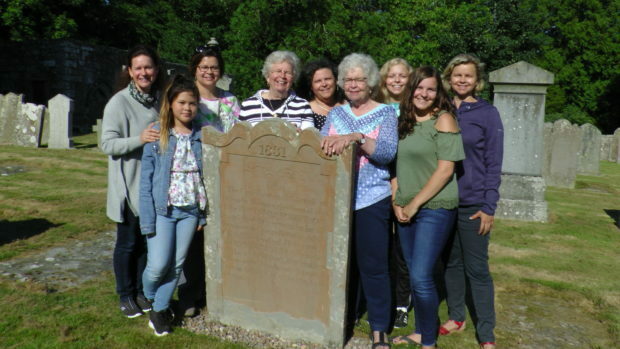 “Katherine said that it was a wonderful opportunity to visit the home of her great-great grandfather at the Old Manse and to hear and share the fascinating history along with her family. “They also visited the gravestone of James Robertson’s two wives who are buried together in the Old Deer cemetery. The group presented Mr Black, who lives in the manse at Old Deer, with a bible that once belonged to Mr Robertson. Mr Robertson worked and lived in Stuartfield for 30 years before moving to the United States and onto Canada. His first wife Ann Crabb was buried at the site after she died on February 5, 1805, followed by Elisabeth Murray, who passed away on May 23, 1831. Mr Robertson’s 15 children lived in the community. One of his sons became the headmaster of a private school in Aberdeen and another worked for Queen Victoria as an artist. Descendants of the minister live in Australia, Canada and Germany and they all contributed to the restoration project.